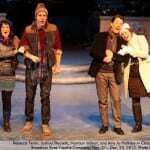 A group of wide-eyed wannabe actors are snowbound in a shuttered Broadway theater on Christmas Eve. With nothing but a few trunks filled with costumes, props, and set pieces, they live out a shared dream – starring on Broadway! 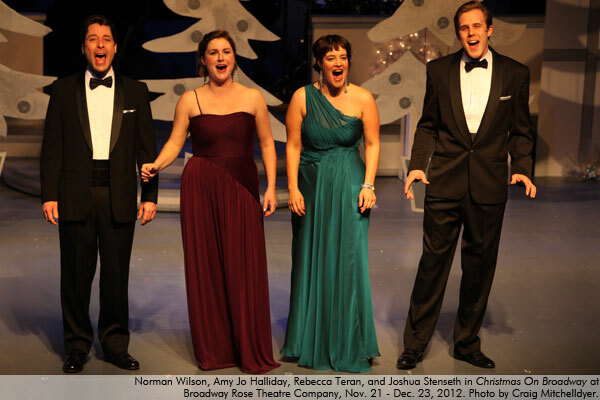 Featuring some of your favorite local performers and filled with seasonal classics from Broadway shows and composers, the evening is a blend of Christmas magic. 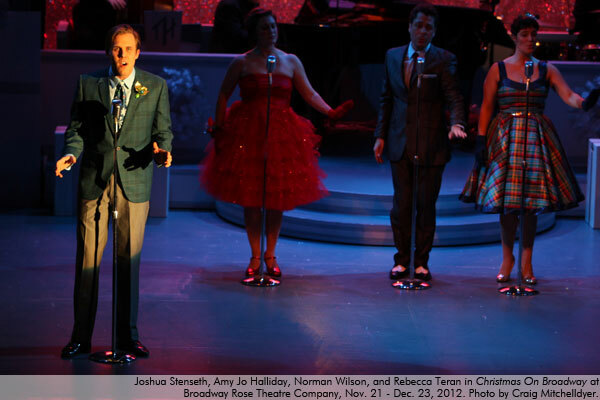 Joshua Stenseth is excited to be joining Broadway Rose again. He can frequently be seen in many regional theaters and in a few commercials. 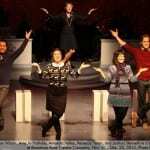 Work with local companies includes Broadway Rose Theatre Company, Curious Comedy, Oregon Children’s Theatre, Tears of Joy, Live on Stage, Clackamas Rep, triangle productions!, Stumptown Stages, and more. Joshua is a proud North Dakotan who received his degree from Minnesota State University. You can see him next in I Love You, You’re Perfect, Now Change right here at Broadway Rose. Rebecca Teran was most recently seen as Audrey in Little Shop of Horrors at Broadway Rose. She has created many roles since landing here in Portland including Colleen in Find Me Beside You (Many Hats Collaborations), Erica in Carnies: The Musical (Action/Adventure), and Kate in Ripper (Broadway Rose Theatre Company). Rebecca earned her B.F.A. from Shenandoah Conservatory. She is the proud recipient of the Portland Drammy and PAMTA awards for outstanding performance in Music Theatre. 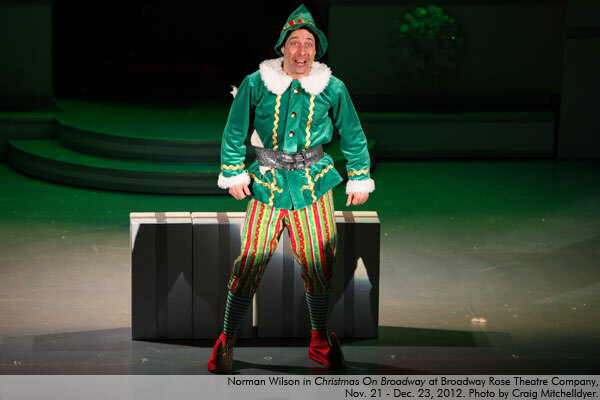 Norman Wilson couldn’t be happier to be spending the holidays in his fourth production with Broadway Rose! 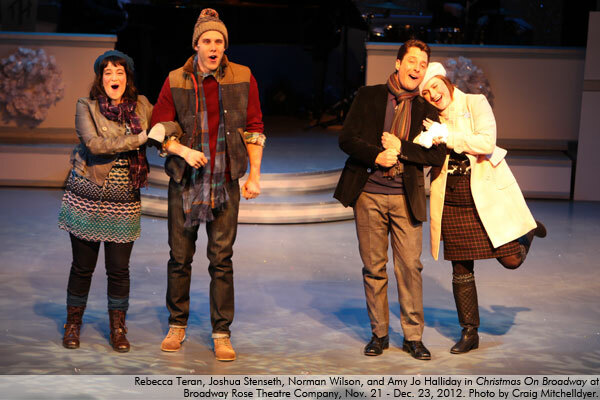 This year, Norman played Aldolpho in The Drowsy Chaperone and Lawrence in The Andrews Brothers. 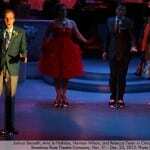 Last year, he was seen as Corny Collins in the summer production of Hairspray. Other local credits include Lucentio in Taming of the Shrew with Bag&Baggage Productions in Hillsboro, Madame George in Find Me Beside You with Many Hats Collaborations, Wally in Wild Space A Go-Go at The Embers Avenue, Charlie Davenport in Annie Get Your Gun at Lakewood Theatre and, most recently, Rod, the closeted Republican, in Avenue Q with triangle productions! 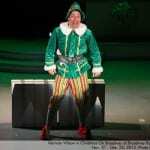 Before moving to Portland three years ago, Norman worked extensively throughout Southern California, appearing in numerous productions with Musical Theatre West, Downey Civic Light Opera, Saddleback Civic Light Opera, Fullerton Civic Light Opera, Candlelight Pavilion, and Curtain Call Theatre. Ben Newton is very excited to be a part of this production! He is a sophomore at Arts & Communication Magnet Academy in Beaverton. He has been seen at Broadway Rose in The King and I as Prince Chululonghorn and in the summer Teen Workshop productions The Music Man as Oliver Hicks and Fiddler on the Roof as Motel. He would like to thank Rick for this amazing opportunity and his family for their love and support. 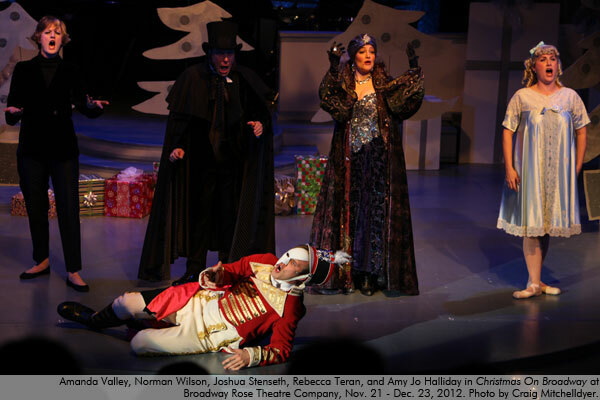 ‘Twas the day after Thanksgiving – some may call it “Black Friday,” but Broadway Rose managed to dispel the darkness with a shiny new entry into the world of holiday theatrical offerings. 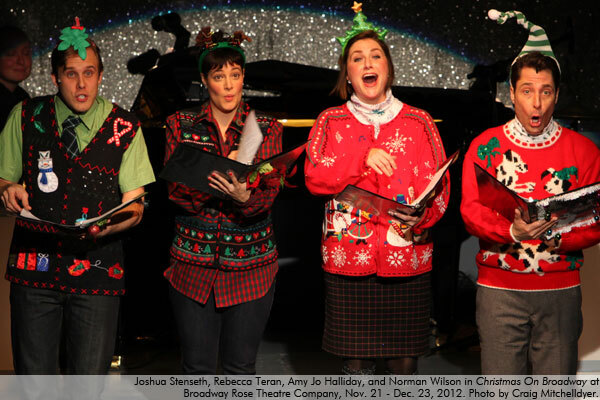 The opening night of “Christmas on Broadway” was a high-spirited, high-energy tribute to every cliché about the holiday season, and it worked like elves on Christmas Eve…Read the rest here. Christmas is a divisive holiday. There are those who decorate their lawns in November and revel in each tinsel-strewn moment with the slack-jawed grin and open wallet of a Midwesterner at Disneyland…Read the rest here. 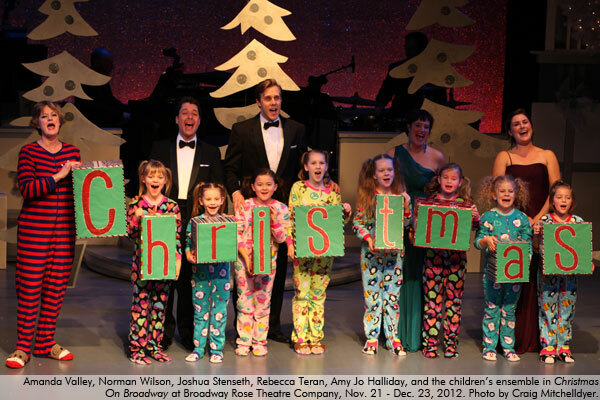 “Christmas on Broadway” possesses a slow and steady charm, and a generous concoction of irony, sparkle and warmth that gradually accumulates as the evening unfolds…Read the rest here. If Broadway Rose Theatre Company actor Amanda Valley looks familiar, it’s because she’s been around awhile, even though she’s been bowling. 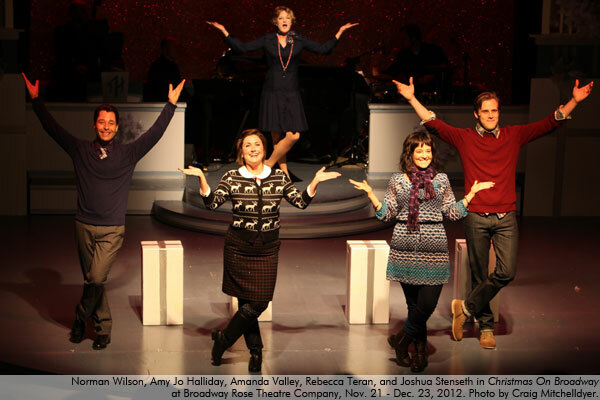 Valley, 40, is one of the lead characters in Broadway Rose’s “Christmas on Broadway,” which opens in late November…Read the rest here. 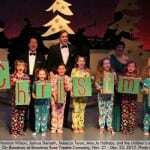 Veteran music director Rick Lewis concocts a nice premise for Broadway Rose Theatre Company’s grab-bag holiday revue: A handful of wannabe performers find themselves snowbound on Christmas Eve in — of all places — a Broadway theater. With time on their hands, and trunks full of props and costumes at their disposal, what else would they do but act out their dreams of stardom on the Great White Way? With the likes of Amy Jo Halliday, Joshua Stenseth and Rebecca Teran among the stranded, those dreams won’t seem so farfetched...Read the rest here.